My name is Jim Garnett and I have been married to my wonderful wife, Lisa for almost 32 years and I have 5 children ranging in ages 15-26. I have been a pastor for over 28 years as well as a Bible teacher at a few different Christian schools over the years as well. 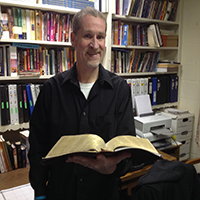 My “hobby” is leading Bible studies – specifically inductive Bible Studies! I have been a trained inductive Bible study leader since 1992. I feel led by the Lord to help others understand the Bible for themselves, so that they can grow in their knowledge and walk with Him. I have a strong desire to reach others with inductive Bible studies who do not have them available to them locally. And I have a desire to reach men and pastors with this life changing method of study! My goal is to help other believers to know the Lord in a deeper way through the study of His Word and though the understanding and applying of it to their daily lives. I also desire for them to become committed disciples of Jesus Christ who can in turn disciple others in God’s Word.